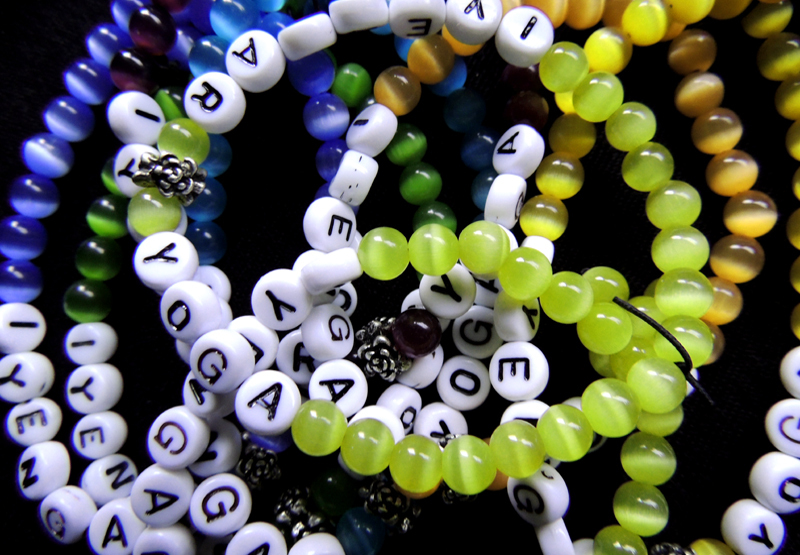 A heap of jewel-bright Iyengar bracelets. It was cookie night last night, by which I know that it’s officially Christmas time, and year’s end. 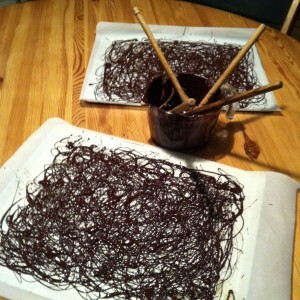 We made Cappuccino Shortbreads, Peppermint Patties, Gingerbreads, Clove Snaps (a clove-and-citrus take on Ginger Snaps), Lemon-Lime Butter Wafers, Kris Kringle chocolate cookies that you roll in either cocoa or icing sugar before baking, and, in a climax of chocolate adulation, Jackson Pollock inspired chocolate lace with orange-flavored sugar. So I woke up this morning with the feeling that before I stop teaching, and blogging, until the New Year, I ought to look at what’s happened in my yoga year. The truth is that deep in the quiet of my own practice, I’ve experienced a sea change. Ever since my first class I’ve been told, over and over again, that I have too much curve in my upper back. My mother and my sister both developed Dowager’s humps, so part of it at least was either genetic or such early postural programming that I might as well have inherited it. Class after class, teacher after teacher gave me a gentle or not so gentle poke, sometimes in my mid-thoracic, sometimes higher. It was so regular a correction that I came to expect that any forward bend, any seated meditation posture, and when Gabriella Giubilaro was teaching, any headstand, would come with a guaranteed poke in the back. No matter how well I thought I was working my shoulders, no matter how straight my back felt, there was always something visible to correct. If there’s a defining feature of Iyengar yoga, it might be the demand for constant inquiry. We are always asked to go deeper, to observe ourselves, to observe the actions in the poses. 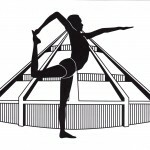 In June I took the basic Iyengar question – “what happens if I do this? 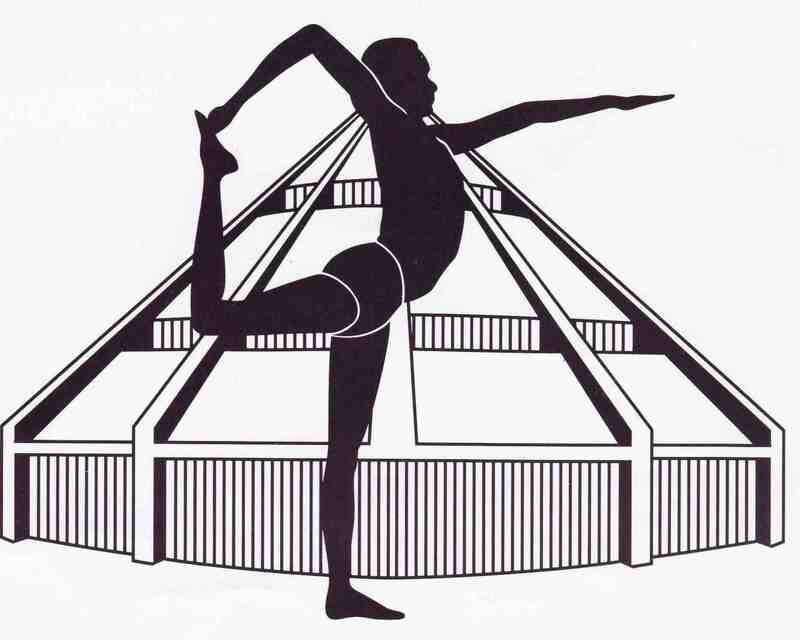 – to the Bandha Yoga website’s suggestion for activating serratus anterior. When I do the correct sequence of actions – upper arms back, down, and deeper into the shoulder sockets, hands pressing apart against resistance – the last little bit of my upper spine straightens. Finally I’ve managed to reverse the curve. Since then I’ve explored that action in just about every pose that puts weight on my arms, and many that don’t. Again and again it works to give my ribcage a close to magical lift and opening. We’ll see if that holds next March, when Gabriella looks at my headstand, but so far it’s been months since a teacher has prodded my upper back in a forward bend. In fact, every pose is changing, perhaps most remarkably, pushing up from the floor into Chaturanga Dandasana, the yoga pushup. With a straight spine, my shoulders stay back and my abdominals engage in a different way. I can tell that my version of the pose is correct, which means that if I just keep working at it, eventually I won’t need the mechanical advantage from the two wood bricks I’m using right now. A work of art in chocolate – and it tastes as good as it looks. And that, friends, will be yoga miracle. That it took 25 years for this to happen may seem like a long time. That so much has happened since June is breathtaking. In the meantime, I wish you happy holidays, joy in your practice, and constant inquiry in the year ahead. The bracelets in that lovely heap of color above come from Kelly Murphy’s Bend Over Backwards studio in Nanaimo, B.C. They’re a fundraiser for The Candles, a group of HIV-orphaned children in Uganda. You can buy the bracelets on the website, or email Kelly at kemurphy@shaw.ca. Dear Eve, it will be interesting to see you in your post Quasimodo state. Your neck is singing your praises. Christmas is upon us. Wishing you and yours a wonderful Holiday Season and all the best for 2013. Above all … Celebrate! I’ll be seeing you soon – Wednesday at 11:30 if I’m not mistaken. Best of the holiday season to you too. Aha! I just tried it. It works! Good to hear from you! Isn’t that just the bee’s knees? Something so simple and yet so effective. How thrilled I was/am to see this story of your yogic evolution. Those benchmarks are deeply satisfying and affirming too. Our beading crew will be delighted at the coverage. The children are on school holidays, the rains have come and planting is underway. Our funds will go to food, the antiviral drugs for half of the kids living positively and new sheets of corrugated iron for the roof if their house. Thank you for your support. Love and Light on BKS Iyengar’s 94 birthday. The bracelets are lovely, Kelly, and I wish you and your crew every success in your efforts to help. 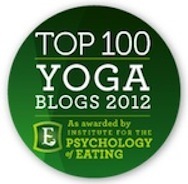 Next post: Can Yoga Help You Lose Weight?